Photoshop CS4 has a new Panel named Adjustments, based on the Adjustment Layers of previous versions. These adjustments can be used for non-destructive editing, can be masked to edit only a part of an image, it can be applied to several layers on a single document and even you can change the Adjustment Layer’s Blending Mode to create outstanding results. This time we’ll take a tour around this wonderful new feature. Photoshop CS4 introduces a new Panel to make our lives easier. Adjustments is a quick and accurate way to edit any picture or image by simply clicking on one of the Adjustment options shown on it. You will be able to edit the colors, saturation, levels, channels, mix colors, add gradients and whatnot from a single interface. You’ll be able to easily change the adjustment settings, hide/show a specific adjustment layer, quickly add clipping masks in order to apply an Adjustment to a single layer or several layers depending on your needs, and much more. This tutorial is a reference guide for any user level, and helps you to better understand this fantastic tool. First of all, lets see what we are talking about. Open Photoshop and check the Workspace selector at the top-right of the window. You’ll see several options, where you can add your very own. A quick way to show the Adjustment tools is by selecting the option Essentials. Another way is just going to Window > Adjustments, either way is fine. You’ll see the Adjustment panel then, in the panels area, at the right side of the workspace. The Adjustment Panel shows two main areas, the first one with three rows of several filter layers, and a second one with several presets for the Adjustment Layers. At the bottom-right there’s a button that is used to enable/disable a clipping mask in order to apply the Adjustment only to one layer, or apply it to several layers below when the clipping mask is disabled. Once you select any of the Adjustments, you’ll see the Settings options on the panel, you can enlarge the panel if that works better for you. Besides you can easily toggle the visibility of the Adjustment, reset the default settings or even discard the Adjustment Layer. To add another Adjustment layer click on the arrow at the bottom left of the panel, that will take you to the list, if you want to go back to the current Adjustment Click on the arrow pointing backwards. Well, that’s enough with the panel itself, let’s try the power of the Adjustment Layers. The first in line is the Brightness and Contrast adjustment. This is one of the simplest adjustments and yet very powerful. You can add it by clicking on the Brightness and Contrast icon on the Adjustments Panel. You can simply edit the tonal range of an image in a very smart way. See the examples below, just move the sliders to adjust your desired settings. If you check the Use Legacy box, Photoshop will only increase/decrease each pixel’s brightness value, that’s why it isn’t recommended. Who doesn’t know about Levels? 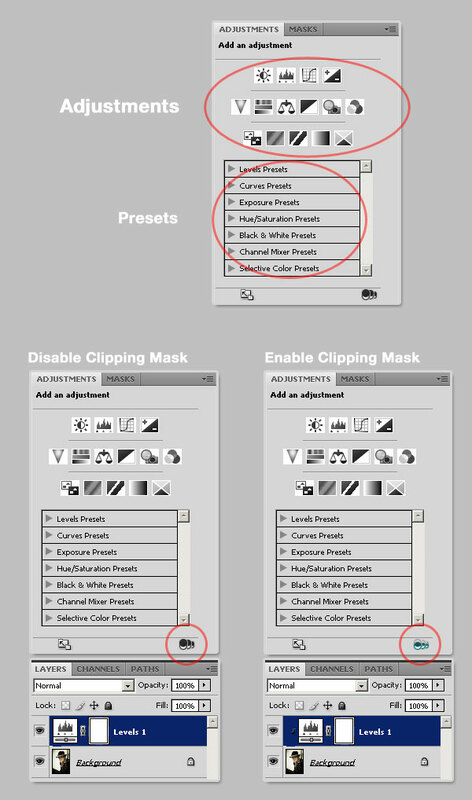 One of the most used Adjustments in Photoshop. You will be able to easily adjust the color and tonal range by dragging three sliders: one for the dark tones, another for the midtones (gamma) and the last for the highlights. To add a Levels Adjustment just click on the Levels icon in the Adjustments Panel and edit the settings as you wish. You can always go back to the Default values as shown in image 2.1 below. Or even customize your desired settings by dragging the sliders, 2.2 shows a dark enhancement dragging the dark slider to the right and 2.3 shows how to highlight the image by dragging the white slider to the left. 2.4 and 2.5 show how to increase/decrease the levels of Black and White. At 2.6 you can see several presets of the Levels adjustment, you can choose any of them and modify it later, 2.7 shows an example of Increase Contrast. Finally you can edit the levels of each channel (Red, Blue, Green) separately, 2.8 shows a dark enhancement of the Red Channel. Besides, you can always click on the Auto button for an automatic correction. In both Levels and Curves adjustments there are three little eyedroppers. They are pretty useful to neutralize some colors in the histogram, by electing any of them and clicking anywhere on your image you’ll be setting a black, gray or white point respectively to auto adjust the colors. In the images below you can see how the black point is set by clicking on a dark gray area of the image (a), since the clicked zone isn’t 100% black the image turns a little bit darker. Then by setting the gray point I’m clicking somewhere over a window (b) that will neutralize the window color for midtones, as the window is a little bit blue, Photoshop will neutralize the blue tone on the entire image making it more red/yellow/orange. Finally, by setting the white point somewhere over a highlighted wall (c), the image turns a little bit brighter. Is a good practice to start with the neutral gray eyedropper. Curves adjustments is a must-know filter for any Photoshop user. It basically lets you adjust points throughout the tonal range of an image (from shadows to highlights) you can adjust as many point as you want (with Levels you can only adjust three). To add a Curves adjustment, just click on the icon on the adjustment panel. The first thing you’ll see is a line, because the tonal range is represented as a straight diagonal baseline, as shown in the image 3.1 below. The horizontal axis represents the input levels and the vertical the output levels. Then you’ll need to add some points to the curve and play with them (3.2). As shows the image 3.3 below you can select only one of the color Channels by choosing it form the select list above the curves graphic. When you’re editing a single channel the points above the baseline increase the intensity of the color, and the points below the baseline make the color a little bit gray, or less intense. Besides you can easily use the eyedroppers to set the black, gray and white points respectively (images 3.4 to 3.6) this process will modify the baseline for each color. Anyway you can always click the Auto button to make your job easier but less accurate. The fourth filter on the list is Exposure, add it by clicking over the icon on the Adjustments Panel. This is a pretty simple filter actually, basically it allows you to adjust the exposure levels by adjusting three sliders, Exposure, Offset and Gamma (4.1). Exposure will adjust the highlights of the image without effecting the dark shadows. Offset will adjust the midtones and Gamma will adjust the dark tones without modify the highlights. This filter is pretty useful when you’re editing or even creating HDR pictures. The Vibrance Adjustment is an easy way to edit the color saturation. Add it by clicking on the Vibrance icon on the Adjustment Panel. This adjustment increases the saturation of less-saturated colors more than the colors that are already saturated. This filter is really useful when you’re editing skin colors. Another must-know Adjustment, Hue/Saturation lets you adjust the hue, saturation, and lightness of a specific range of colors in an image or simultaneously adjust all the colors on it. Add it by clicking on the Hue/Saturation icon on the Adjustments Panel. To adjust all the colors at the same time select Master on the color list and then move any of the three sliders. The Hue slider changes the color itself (6.2). The Saturation slider modifies the amount of the color, less saturated color means a more gray image (6.3, 6.4). The Lightness slider adjusts the amount of black/white of the image (6.5, 6.6). The image 6.8 below shows the colors list, which means that you can edit only one color channel and adjust the hue/saturation/lightness values only for that channel (6.8). Finally there’s a check box named Colorize, check it if you want to colorize a grayscale image. For full color images I recommend the Photo Filter Adjustment, that we’ll see shortly. You’ll notice there are three eyedroppers below the sliders in the Hue/Saturation panel. To make them work you must select a color channel first, the Yellow channel in the following example. Use the first eyedropper (a) to select a base color range, e.g. somewhere over the sand, then play with the sliders. Following select the next eyedropper to Add a color range to the editable range (b). Finally, you’ll notice in the following example that the girl’s skin tone became almost red because of the adjustments. In order to fix it select the last eyedropper to delete or remove a color from the editable range of the face skin tone on the example. The final result is at the bottom of the image below (d). Useful isn’t it? The seventh on the list is the Color Balance adjustment. Add this filter by clicking on its icon in the Adjustment Panel. This adjustment changes the overall mixture of colors in an image for generalized color correction. It basically adds something like a tint over the Shadows, Midtones and Highlights of the image. By default the filter shows the Midtone colors’ mix in 0 (See image 7.1 below) you can move the sliders to paint the midtones. I painted the midtones a little bit yellow (7.2). Do the same with the Shadows and Highlights, as shown in the images 7.3 and 7.4 of the example. I’ve painted the shadows red and the highlights a little bit blue. Maybe one of my favorites, the Black & White adjustment allows you to create quick and beautiful grayscale images. Add this filter by clicking on the B/W icon on the Adjustments Panel. This filter allows you to maintain full control over how individual colors are converted. Select the Default mode to create an automatic black and white image, or chose one of the many presets. Click on the auto Button to automate the adjustment. Besides you can mark the Tint checkbox and colorize the grayscale image. This Adjustment is just like if you put a color filter in front of the camera lens. Add it by clicking on the Photo filter icon in the Adjustment Panel. The are are several presets based on standards (see 9.1 below), increase/decrease the filter’s density to adjust the color intensity. Image 9.2 shows a warming filter by using an orange tone, and 9.3 shows a cooling filter by using a blue tone. You can easily customize a color filter by selecting the color radio button and selecting a color from Photoshop’s color picker. This Adjustment makes it easy to create high quality tinted or grayscale images. Add it by clicking the Channel Mixer icon in the Adjustments Panel. On the Adjustment Panel, select an Output channel as shown in the image 10.1 below. You’ll see the slider associated to the selected channel is 100%, then you can modify the color values by using the sliders (see 10.2). You can work with other channels as well, for example on the image 10.3 the Blue channel is selected. There’s a color enhancement over the image’s blue areas (like the sky), as shows images 10.4 and 10.6 below. You can click over the Monochrome checkbox to edit the channels in grayscale mode. This is very useful to create advanced grayscale images, or apply a custom tint to an output channel or choose any of the several grayscale presets (10.5). This is the simplest adjustment ever, but yet so useful. Click on the Invert icon in the Adjustments Panel and you’ll see the image’s colors inverted (like a negative). Posterize is a rapid way to adjust the number of tonal levels. Add this Adjustment by clicking on the Posterize icon in the Adjustments Panel. The Posterize works this way, you chose a Levels’ value, e.g. 5 (see the image 12.1 below) that means the image will have 15 colors, 5 for red, 5 for green and 5 for blue. The higher the levels, the better the better quality the image. This adjustment converts any picture into a two color (black and white) image. Add this adjustment by clicking on its icon in the Adjustments Panel. How it works? You specify a Threshold Level, all the pixels darker than that level will turn into black and all the pixels lighter into white. The Gradient Map adjustment maps the grayscale range of an image to the colors of a custom gradient fill. 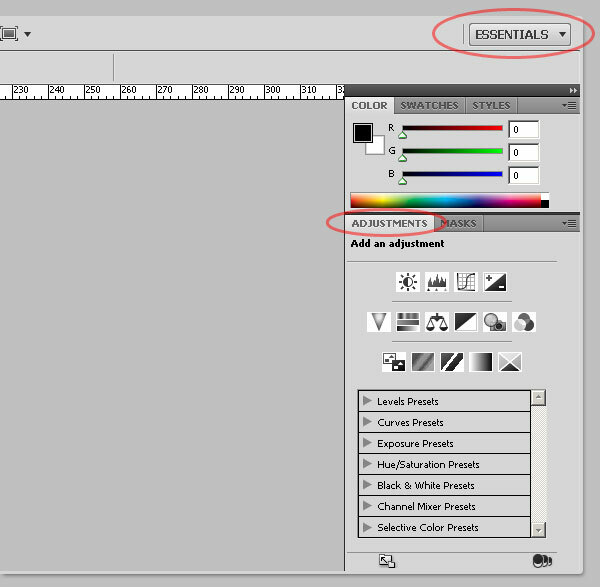 To add it click on the Gradient map icon in the Adjustment Panel. The way this adjustment works is really simple, one of the sides of the gradient replaces the dark areas of the image, the other side replaces the highlights, and all the middle tones of the gradient replaces the midtones of the original image, just as examples 14.1 and 14.2 show below. Click the Dither checkbox to add random noise in order to make the gradient smooth. Click on the Reverse checkbox to invert the colors of the gradient (14.3). With this adjustment you can modify the amount of a primary color selectively without affecting the other primary colors. This filter works extremely well on CMYK images, but it works on RGB as well. Add it by clicking on the Selective Color icon in the Adjustments Panel. As you can see on image 15.1 below, there are fields to select the channel. Adjust the CMYK colors percentage and select Relative or Absolute adjustment, for example on image 15.3 the Cyan color is selected and I increased its amount of Black in order to make the sky darker. That looks fine because the Absolute option is selected. The Absolute value adds the exact percentage to the color channel. The Relative option, as shown in image 15.4 is less dramatic since it changes the existing amount of the CMYK colors by its percentage of the total. Obviously this is only the the tip of the iceberg of the unlimited power of this panel. Since each Adjustment Layer has all the properties of a Layer in Photoshop, you can change its Blending Mode, Opacity, Mask it, or even combine several Adjustment Layers to create outstanding results. Your imagination is the only limit.